Symbols of the next three regions are presented in this part of our series on regional arms and flags of the Czech Republic. The rowan-tree twig stands for mountainous countryside of the Highlands region while the red hedgehog is a typical figure of the region’s seat Jihlava municipal arms. Regional authorities designated charge of the second and third quarters as for characteristic features of the landscape (2nd) and history (3rd) of the Ústecký region. Finally, geological formation called Porta Bohemica in the form of a silver tower, three green hills of the Krušné hory mountains behind and blue-white wavy stripes standing for the river of Elbe have been chosen to represent the former, while a silver plough on blue, over a green base, that is associated with the Przemyslides princely dynasty should refer to the latter. The fourth field of the arms and/or flag of the Moravian-Silesian region recalls lesser historical dominions situated on its area – principalities of Těšín (dexter) and Opava (sinister). The full coat of arms of the city of Ostrava is placed in the third quarter of the same regional arms. 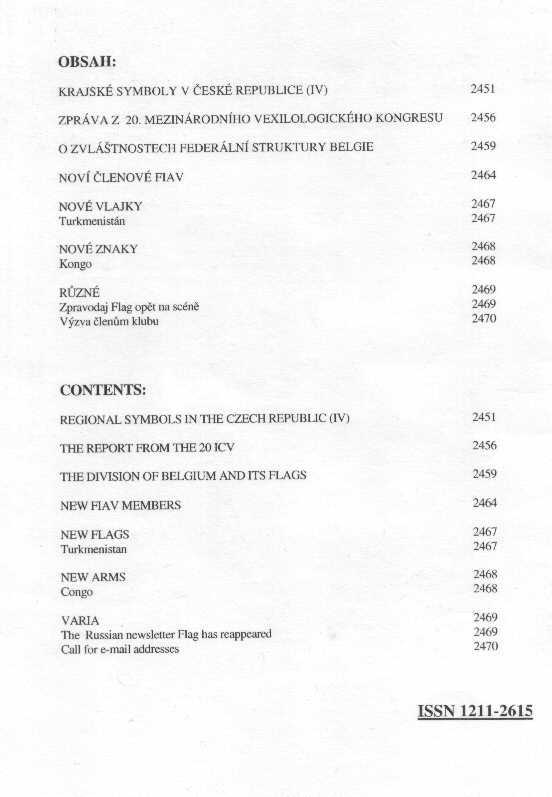 Symbols of the last region (South Moravia) have not yet been granted by the Speaker of the House of Deputies. Somewhat complicated and incomprehensible territorial management and administrative division of Belgium is dealt in this article, as much as its reflexion in Belgian regional and communal flags. Territorial extension of the Flemish, French and German speaking communities is shown under Fig. 2,3 and 4, while that of Flemish, Brussels and Walloon regions is presented under Fig. 5,6 and 7. Both types of these entities are authorized to display their own symbols, flags including. As the Flemish community and the Flemish region are occupying the same area, the common authorities govern them and they use the same flag (Fig. 9). A similar situation is with the flag of Walloon entities (Fig. 10) while the German speaking community (Fig. 11) and the region of Brussels (Fig. 12) have their own flags.